There truly is no sparkle like the sparkle of a crystal clear diamond. The birthstone for the month of April, diamond wearing is definitely not reserved for April babies only! We wear them as symbols of love and devotion, they represent wealth and power and they are passed down from generation to generation. Diamonds have their own histories and stories—mythological and mysterious, they have been worn and prized since man found them. Three billion years old and made of pure carbon, diamonds were created in the earth’s upper mantle under heat and pressure and carried to the earth’s surface by volcanic action. Formed as a cubic crystal with refraction unlike any other mineral, when cut and polished a flawless diamond will refract all the light beams back to the viewer. Compared to other minerals a diamond is rated the highest, a ten, on the Mohs scale for hardness. Hardness of a mineral refers to the ability to scratch the surface, ten being the most difficult. However, a diamond can chip, cleave or crack easily if it is ‘hit’ at a certain angle with force. Diamonds can also burn at temperatures above 750 degrees Celsius and a sudden change in extreme temperatures can cause internal fractures. Primary diamond deposits are called ‘diamondiferous pipes’ which are solidified Kimberlite, (a potassic volcanic rock) or Lamproite, (formed from partially melted mantle at depths of over 150 km). Secondary diamond deposits are places where the diamonds have been transferred to from their original source via natural causes. Diamond deposits are found all over the world, including Botswana, Russia, Canada, South Africa and Australia. They are in deserts, frozen tundra and ocean beds. Flawless diamonds or diamonds with few inclusions are extremely rare and expensive. Impurities causing irregular crystal growths within diamonds are referred to as flaws or inclusions. Only about 20% of all diamonds found worldwide are good enough for jewelry and only about 1% of those are of the highest quality and clear of inclusions. When diamonds are extracted from the ground they are translucent or opaque and are rough in appearance. The diamond cutter will determine the best shape to cut from each stone to maximize the weight, symmetry and ideal proportions for light refraction. The cutter will then cleave the diamond, which is splitting it along its natural crystal grain, facet the rough diamond and will finish the process with an overall polishing. 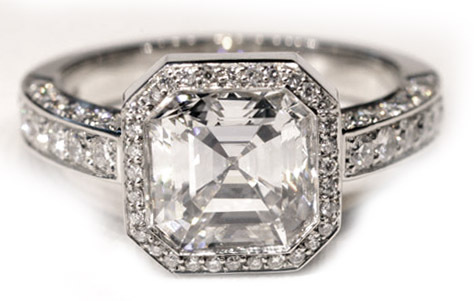 A ‘brilliant cut’ is the most reflective of all the diamond cuts. When cut to ideal proportions, the facets start at a central point and radiate towards the edges, there are fifty-seven facets and are referred to as a full cut. A single cut diamond has seventeen facets. Small diamonds called a ‘chip’ is a common misnomer.